Researchers have been trying to understand the connection between gum disease and other aspects of overall health for years. But a study recently led by the University of Pennsylvania may shed some new light on the subject—there may be a correlation between diabetes and Periodontal Disease, or gum disease. That link may be more ambiguous than we would like, but as more research is conducted, a picture of the role our gums and mouth play in our overall health is coming more into focus. Periodontitis is a serious gum infection that damages the soft tissue and destroys the bone that supports teeth. While many of us commonly call it gum disease (or also called pyorrhea), the term refers to a set of different diseases that affect gum tissue. Periodontal Disease is typically the result of negligent oral hygiene, which allows plaque to build up and harden into tartar, causing gingivitis, the mildest form of Periodontal Disease. Some symptoms of gum disease include swollen or tender gums, gums that easily bleed or recede from teeth, bad breath, and loose teeth. If unaddressed, it can result in lost teeth and overall health conditions such as respiratory disease, rheumatoid arthritis, and coronary artery disease. Who is Typically Affected by Gum Disease? About half of all Americans over the age of 30 have some form of gum disease, and in those older than 65, about 70 percent of that population have some kind of periodontal disease. While until recently there seemed to be no definitive evidence that diabetes affects the body’s oral microbiome (the collection of microbes that are found naturally in our mouths), a new study published in Cell Host & Microbe shows that diabetes causes a shift in the pathogenicity (the ability of an organism to cause disease) of that microbiome, and was associated with bone loss and increased inflammation in mice. 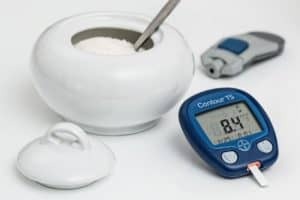 More work needs to be done, but this study uncovers some of the mystery of the connection between diabetes and Periodontal Disease. So – What Does This Mean for Me? Beyond the science, the results of this study indicate that if you are diabetic, you probably should take extra care with your dental hygiene and health. And while your daily brushing and flossing regimen will be your first line of defense against gum disease, regular inspection and cleaning at your dentist’s office are your most important steps to remaining gum disease-free. Our professional staff at Merion Village Dental is happy to help you schedule your first appointment – call us at 614-420-2665 or visit us online to get started.